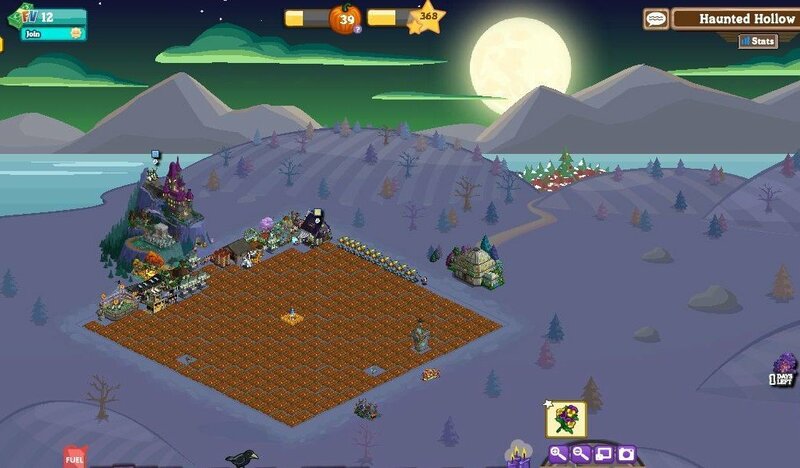 This is my lighthouse cove farm on January 15, 2012. I was getting so crowded for space that quality (high yield) was becoming more important than quantity. I have sold all animals outside animal storage buildings except for about 1000 calves. Calves have the highest yield/time/space of free-roaming animals. Once a tree was mastered, those trees were sold and the orchards used to grow more peach palm trees. February 17, 2012. level 119. 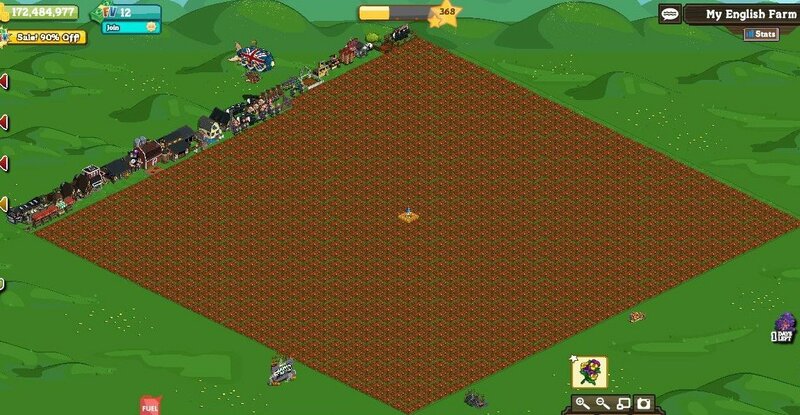 Lighthouse cove farm maxed out to 34x34. I have been growing > 100 seedlings/day and continued to build about 5 orchards/day. There are > 300 orchards and > 1000 calves. Orchards on the left have trees that not been mastered yet. Most mastered trees have been sold and orchards recycled to generate peach palm tree seedlings. I have started purchasing belted cows (22 so far) because they provide the highest yield/time/space in the game. February 26, 2012, level 123. 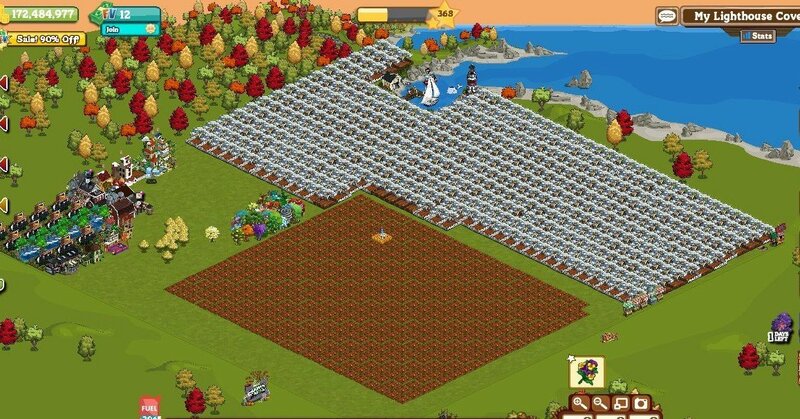 I have over 300 FarmVille neighbors. Close to 200 are also facebook friends, so the feeds give me plenty of stuff. I am starting to run out of space again in Lighthouse cove. There are now about 350 orchards, 120 of them with peach palm trees. They give me about 30 seedlings each harvest, so I can fill up those orchards ASAP. The remainder is used for mastery points. I have sold all animal buildings in lighthouse cove, other than the cow pastures. I have started building orchards in winter wonderland, because I don't have enough space in Lighthouse Cove to use all the trees and seedlings I get from the feeds. Current coin revenue is about 1.5 million coins each day. July 2012, level 230, Jade level 60. I have about 480 FV neighbors with more than 300 of them facebook friends. That is way too many to visit, but very useful to send and receive gifts. I do not have the England Farm. All farms are to max without spending FV-cash. Blue whales in the aquarium / swimming pond are now the highest yield animal in the game. The azalea bonsai II tree is now the highest coin-yield tree in the game. Current revenue is about 7.5 million coins and 4 million coconuts each day. Those are used almost exclusively to buy belted cows and blue whales. 1. Home farm = max crop farming for crop mastery. No trees or animals. The calves are still in Lighthouse Cove. There are now 366 orchards, all with Azalea Bonsai II which gives almost twice the coin yield of peach palm trees. The 1000+ peach palm trees that I had in Lighthouse Cove have been moved to Winterwonderland (not in orchards) where they'll remain until I run out of space there. 3. 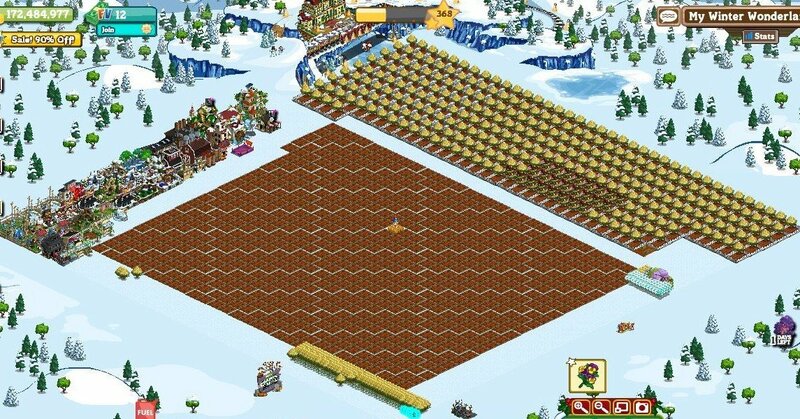 Winterwonderland is currently being used mainly for crop mastery and for coconut generation with Choco Macadamia orchards. 4. Hawaii is becoming a whale farm. All water crops have been mastered. The water plots are being reduced to make place for the aquariums with blue whales. The swimming pond is a new building, that will eventually replace most of the other animal buildings and some of the land crops as well. 5. Jade Falls is still new, and is slowly being developed. All available crops have been mastered, except for the gopher crops. This means that from now on the crop plots in most farms can be reduced to make space for more orchards, cow pastures and swimming ponds. It takes time to build these storage buildings and fill them. Crop plots will be gradually replaced by these buildings. In the meantime, crops will be planted with the highest yield/space/time (e.g. purple tomato) to maximize revenue and to allow to make craft recipes. The majority of the calves in Lighthouse cove have been removed, to be replaced by the azalea bonsai II trees. The peach palm trees in winterwonderland have been sold off and are slowly being replaced by Choco Macadamia trees. Orchards are being harvested with Choco Macadamia, to maximize the coconut generation to buy blue whales. 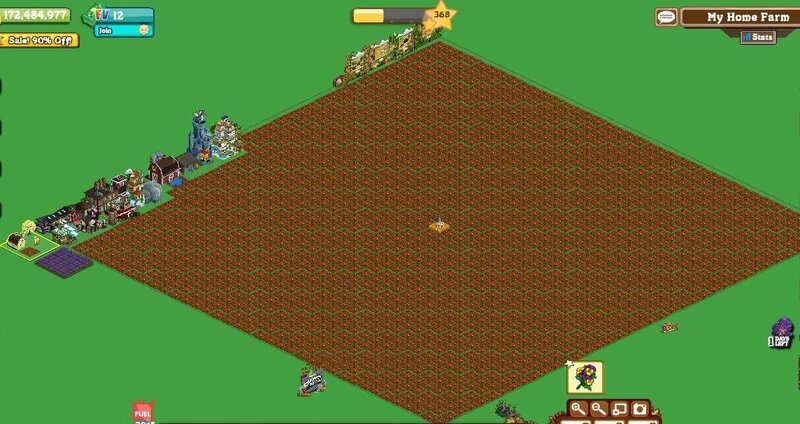 Zynga finally let me have England Farm and released 2 more farms this October for a total of eight. 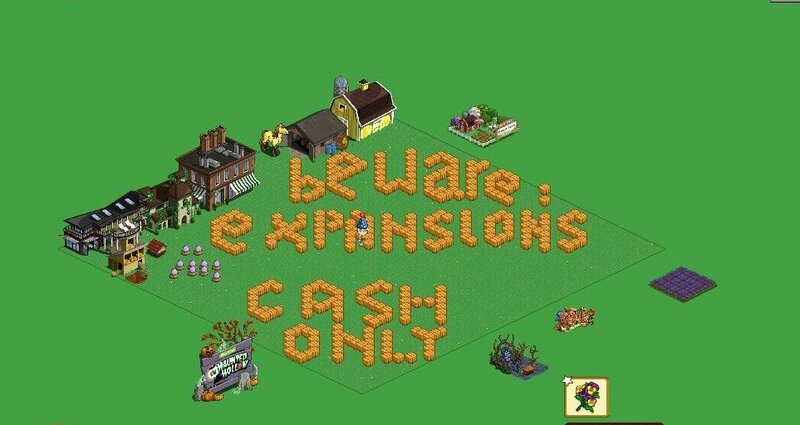 Jade Falls, Haunted Hollow and Sunflower meadows remain pretty useless because of cash-only expansions. 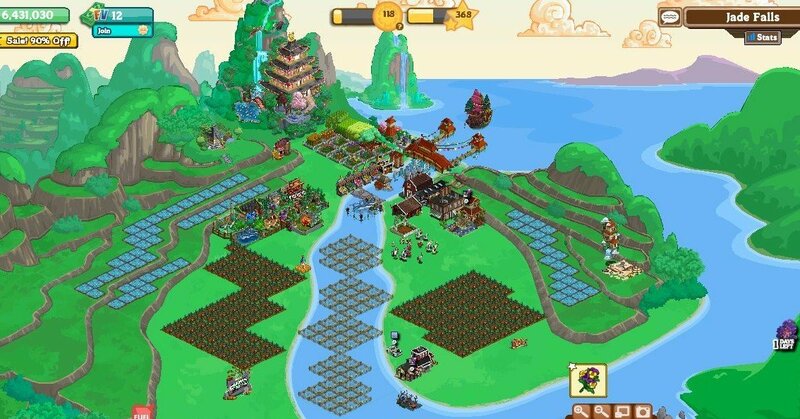 Zynga also released some new crops with insanely high mastery counts of up to 600,000. 450 orchards in lighthouse cove, 230 in winterland + building up to 450 as well. Hawaii has close to 200 aquariums and swimming ponds. No water plots, land plots have been reduced 50% to make room for swimming ponds with blue whales. I have started to sell off the beehives. I'm tired of being interrupted by those eternal "pollinated seeds" pop-ups during harvest. Current revenue levels are over 25,000,000 coins and 20,000.000 coconuts DAILY. 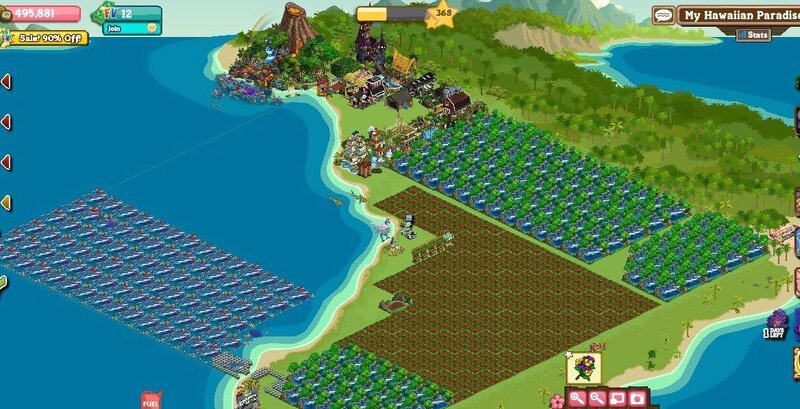 This is almost entirely from the blue whales in my Hawaii farm . Add to that another 5M coconuts from the orchards every other day. I am getting more blue whale babies than I can find feed for. The babies + market purchase from revenue = about 100 new blue whales every day. Earlier this week, Zynga closed its Boston office and laid off 2/3 of the Austin employees. Massive outsourcing to India instead. Some pages are incomplete. This Site is and always will be under construction!